I am a home Cinema and AV enthusiast as well as a custom installer. This is my review of what I consider to be the best Home Cinema products on the market. The time came for "upgradeitus" one of the things I had always wanted was a decent in ceiling projector lift for my Epson TW 4400. The main criteria was that I wanted the projector to be hidden when not in use as this is our family lounge. 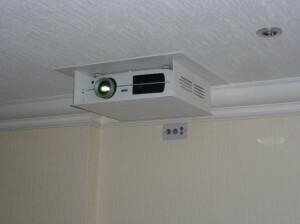 In the past I have fitted all makes of projector lifts from different companies such as Beamax, Draper, ProAV to name a few, all good products, but, the problem being none would fit into the space in my ceiling. The joists are 200mm or 8" x 2" in old money, no other lifts would fit into the void without building a massive bulkhead which sort of defeated the purpose of what I wanted to achieve. I spent several years searching for the right product to no avail, that was until I came across the "Pure Theatre" website. The large ceiling recessed projector lift at £1,275.00 was not only more than half the price of other products, it would actually fit into a standard ceiling void in a house, not only that, this lift looks stunning and is way ahead of other products in the Home Cinema market. I also ordered the 12v Trigger Module with RS232 and IR output for my screen and lift. I ordered direct via the phone which was a breeze, Pure Theatre staff was ever so helpful and very knowledgeable about their own products. Payment was made via debit card although you can also order direct from the website which is great to peruse. I ordered late Wednesday afternoon and the lift arrived early Friday morning. I was like a kid at Christmas! I could not wait to un box my new toy. After checking my measurements and looking under the floor I knew that I would have to make some adjustments to the joists. One joist would be directly in the way of my new Lift. This was no problem as I would trim the joists into the opposite direction. Once the box was opened and after perusing through the instructions, it was time to start fitting my new ceiling recessed projector lift. The lift comes with its own metal template that is used for marking the opening, just offer the template up making sure everything is square , scribe around the inside of it with a pencil and mark the 8mm holes. It is so simple, you then drill through the previously marked holes, I then drilled a further hole on the inside of the pencil line so that i could get my jigsaw blade in ready to cut out the plasterboard. Whilst cutting out the ceiling I knew there would be a joist in the way so off I went upstairs ready to take a few floor boards up. I then had to prop the floor so I could cut out the offending joist that was in the way. This was then trimmed in the opposite direction using joist hangers and some new timber with a few fixings. At the same time I had to move a few electrical feeds that was used in my previous setup for the Epson Projector including a double socket and HDMI leads, etc. Once everything was prepped it was time to drop the metal template into position and line them up with the previously 8mm drilled holes. Like a dream these lined up perfectly. Next I tested the lift was working before separating the mechanism from the projector housing. I then installed the transformer into the ceiling cavity and connected it to my mains power supply allowing for the 24 volt plug to hang down for easy connection to the lift. With my step ladders in place I offered the the lift up to its new home and fixed in place using the screws supplied into the template. What surprised me was how sturdy this was when fixed in place. There is further fixing points via the two brackets for later when nearing completion. The lift fitted like a glove! Wow, how happy I felt. After admiring my work for some twenty minutes with a well earned brew it was time for the next stage. After placing the Epson Projector into the tray it was time to lift up the housing and fit into the lift mechanism using the two fixings on each side. I then completed final fixings and secured all the screws. The lift was now ready to use. I could not get my hands on the supplied remote quick enough pressing down on the remote control. Almost instantly the Pure Theatre Lift purred down into place looking even more stunning than I thought it would. Time to press up, then down, then up, then down, etc. This lift is without doubt a superb bit of kit, it is easy to fit and looks far better than other lifts I have fitted in the past. The price is easy within the budget of most home cinema enthusiasts considering other lifts cost more than twice the price. It works flawlessly and is quiet and very pleasing to the eye. The other thing that springs to mind is how clever the design is, whoever thought that they never had the room for a lift in the ceiling now do as Pure Theatre have designed their products to fit in most dwellings between standard floor joists – Pure Genius!! Imagine pressing a button on your remote and the projector automatically switches on while the screen and lift purr down into position showing your favourite channel. All this in a matter of seconds using products supplied by the Rolls Royce of home cinema – Pure theatre.